Tigers are strong, powerful and beautiful animals. Untamed and adjustable, they thrive in a wide range of habitats. 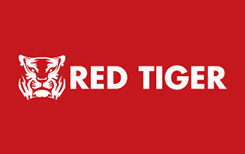 Red Tiger Gaming is the company that possesses the same characteristics and therefore deserves its name. Original and uncompromising this iGaming developer is rarely visible to players, but it doesn’t mean it watches them. If you doubt the skills of Red Tiger Gaming because you’ve never heard of them, just try their games. You’ll see that this is a premium games supplier which often follows unexplored path. This is a fearless and extremely smart developer, which apparently hires great talents. Playing their games is possible since 2014 as this was the year Red Tiger Gaming entered the industry. It became obvious that the supplier was a success right after their first game release. The fact that the company was founded by experienced people helped them find the right direction and make themselves quickly recognizable. If you have a chance to see a tiger in a wild, you are extremely lucky. And if you happen to play Red Tiger Gaming slots, you are very lucky as well. So, don’t wait for too long. Just jump into playing their immersive games as they are available in practice mode as well. The supplier is registered on the Isle of Man and owns a license in this jurisdiction. Another regulatory body watching their business is UK Gambling Commission. Having these licenses means the supplier follows a wide range of rules, including game fairness. As long as these commissions are fine with the company, there’s nothing you need to be afraid of, and playing Red Tiger games is safe and secure. This iGaming developer has no track of any wrongdoings, and is known as reliable, secure and the one that has high values. So, generally, the idea of it delivering biased software seems to be absurd even though no certification of trust from testing laboratories is presented on their website. For the most of the time Red Tiger Gaming is busy developing video slots. However, they’ve got other types of games in their portfolio. Talking about quality of the products, we would put this company in the same division with biggest suppliers like NetEnt. They provide a range of table games which are visually amazing and have very though-out design. Hand history is typically available on the right side of the screen which is very convenient as players won’t have to look for it elsewhere. Even though most of the time this information doesn’t help punters win, it feels better having it in plain sight. There are three most popular table games Red Tiger Gaming offers. Unfortunately, many operators choose to have only slots produced by this company often ignoring those beautiful games. Playing majority of their video slots is like a breath of fresh air. That’s when you understand that slots don’t have to be all similar. Their style is soft and aggressive at the same time. Majority of their titles are completely stunning with excellent visuals. After playing so many great and bad video slots, we can sincerely say that best Red Tiger games are one of the greatest slots of all times. Take Arcade Bomb, for example, it’s one of the most unconventional slots. You’ll love it if you want something very simple but highly dynamic. There are just over 40 titles and all of them are extremely immersive with just few exceptions, but that’s just the matter of taste. The only thing we can confidently say is that each and every title is made with great attention to details. Remember we’ve mentioned about psychologists being hired by the supplier? Getting advice from psychologists must be a really great way to make sure they get striking games.